Thank you for your very kind words, Kathy! There are different styles of Rhodia journals. Mine is a soft cover notebook, 5.8×8.3 inches. It has 90 gsm ivory brushed vellum paper made in Étival-Clairefontaine, France. It has a ribbon bookmark and an expandable inner pocket. I ordered it from Amazon where you will find several color choices. I love your painting, Dawn! I’ve only ever been in minus 10 degrees so can’t imagine minus 50! I would think it would be hard to breathe. This was the first year I’ve had a “word.” It came to me late in the year and has proven to be just the right word for me. I wrote about it on Morning Musings and Another Perfect Day. I love your word. I will have to think about it for next year–especially if I get my life in balance this year! The best to you and your beautiful parents as they transition into their new life. Oh, thank you, Cathy! The workshop instructor guided us step-by-step as we sketched and worked to create the Northern Lights in the night sky. I’m so happy that a special ‘word’ found you this year! I must come visit to read all about it. I think this is already my seventh ‘word’ and all of them continue to guide me. Dearest Dawn, it’s so nice to hear from you this evening. It sounds like you and your parents are sharing glorious times as they wait for their new home to be complete. You paint a lovely picture of times spent together reminiscing and making new memories. You have been on my mind with this extreme cold. I’m so glad you are all snuggled in your sweet home with time to create and enjoy. Your bullet journal is always inspiring to me along with my daughter’s journal that I have one that I call my Healthy Journal. It’s not as lovely or creative as your’s, but it’s fun to track all the things that keep me healthy. Longer walks every day add to my steps. I track what I eat, my blood pressure, and my blood sugar that is back to normal –I’m so proud of that!!! I also include my weight, water and any other issues that concern my healthy goals. I started off with different colored pens, but now I just use black. It’s not pretty, but my doctor loved seeing my progress. Martha Ellen, you have been on my mind so often. I promise a letter very soon! I’m so happy that you are following Noël’s journaling inspiration. 😊 It’s such a valuable way to monitor our healthy habits. I have also shared my Self-Care journal with my doctor. You should be so very proud of your wonderful progress, dear friend! 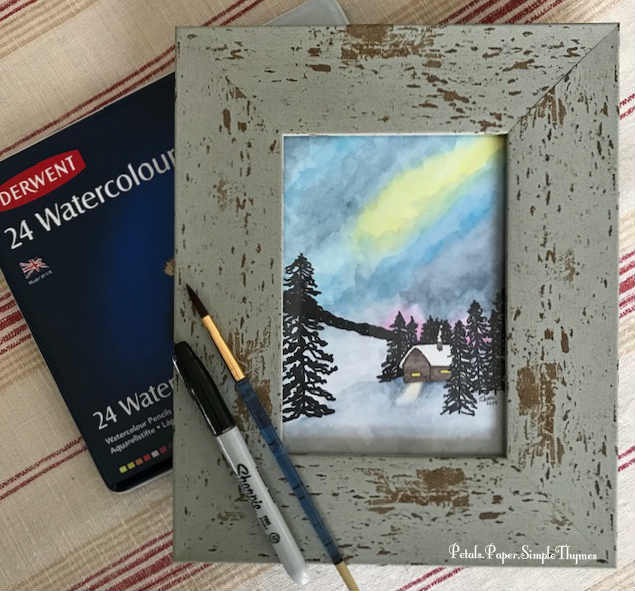 That’s a sweet little watercolor of the cottage, Dawn. I suspect we’re not too distant geographically, less than 50 miles, so the weather here is pretty much the same. Bitterly cold. I’ve been working on my spouse’s genealogy (fascinating and lots of ancestors all the way back to Henry II of England and Charlemagne with at least 3 Mayflower ancestors and several who served in the Revolutionary War) and my own (far more ordinary and no where near as extensive) as well as a bit of kniting from time to time. The hill we live on is kind of steep and the street quite busy, the alley is presently impossible to drive on with the deep snow and ice. Stay warm. I’m off to make a nice pot of Lapsang Souchong tea. That is COLD! What a jolt for your parents! From Arizona to Antarctica. The minute I hear of weather like you are having, I think how hard it would be taking care of horses in that weather. I made many trips in my day, trudging down to the barn carrying buckets of hot water to break up the ice in the water buckets!! And making hot bran mash to feed them and keep them hydrated! It seems like a lifetime ago. I love your new word for the year! I had a really hard time finding my word this year. It finally came and I settled on grateful. I have struggled with having my life on hold as I become a 24/7 care giver. So each day I list my blessings. It has helped. I really do have so much to be grateful for, but sometimes it gets lost in the hum drum of the day’s routine and the appointments. But I have started crafting again. I finished one Valentine project and started a second. So I am keeping busy and spending the afternoons reading for an hour or so if Jim naps. I am able to at least carve out some time for me. Memories are so important. It is what binds us together. I am so glad you have been able to spend this time with your parents sharing all those wonderful times and creating new memories. Stay warm! Spring will be making an appearance when it is darn good and ready!! So very grateful for your kind, encouraging words this morning, Chris! We have another day of very challenging Arctic weather today. We are trying so hard to keep my parents warm and healthy. This is their first time back in Winter after 24 years of desert living. During the first month, we would bundle up and go out for nice, little adventures together. Now we are staying inside. It’s just too dangerous (and slippery) for my parents to be outside. So, we are focusing on how nice it will be once they are settled in their new apartment. The Senior Living community has nice places to walk indoors, a fitness center, library, movie theater, and several beautiful gathering spaces with cozy fireplaces to bring neighbors together. It will feel spacious even on the coldest winter days! Chris, I’m keeping you close to my heart as you adjust to your new lifestyle. I’m so relieved to know that you are making a bit of time for yourself. A bit of creative time always refreshes my soul. It’s so powerful and so healthy! Your word this year is perfect, my friend! Just knowing that I will write my blessings on the Gratitude page in my journal reminds me to look for the blessings all day long! Keep counting your blessings out loud!! Consider listing your Reasons to Be Proud, too. It has been very uplifting as I embrace more of a caregiving role. Are you a scrapbooker, Chris? I’m planning to start scrapbooking again after many years. My first project will be a scrapbook for my parents called The Big Move. Over the past year, I documented this entire life-changing chapter. I have so many wonderful photos (and video clips) that will be so helpful in the future to help them remember both of these special chapters in their lives. I have lots of photos with their Arizona friends and am taking photos as they are making new friends here. Each time we scroll through the the photos, we are truly amazed at all that we have done together over the past year! I think a scrapbook will be a very valuable, heartfelt, tangible gift as we move forward. I can’t wait to get started!! I’m wondering if you might like to be part of my scrapbooking ‘tribe’ working on our projects together… across the miles. We could use technology to make that work, my friend! 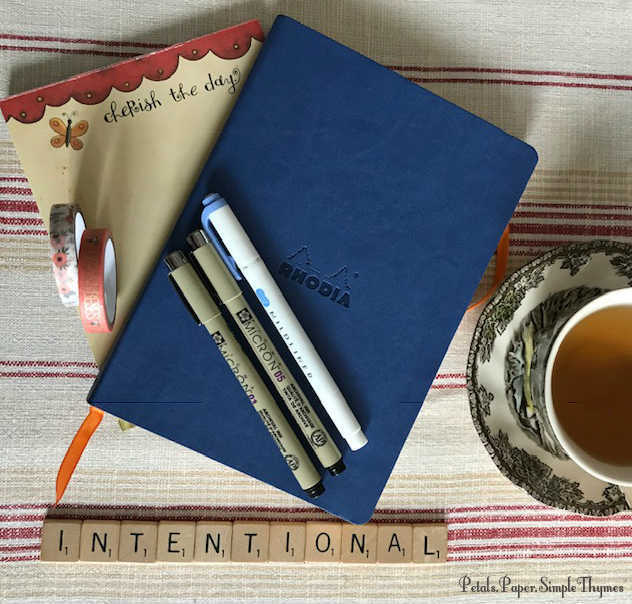 Intentional – a good word that is full of purpose, grace, and hopefulness, I think. I don’t use/do a word, but, purposeful keeps popping in my musings, prayers, lists. I’m actually in the process of writing a blogpost about our weather! It feels downright balmy at 15 degrees at the moment – a good 35 degree difference from yesterday – and still cold. I imagine it to be quite a jolt for your parents right now, as they slowly acclimate to the midwest again. What a positive, intentional outlook you have, Dawn. 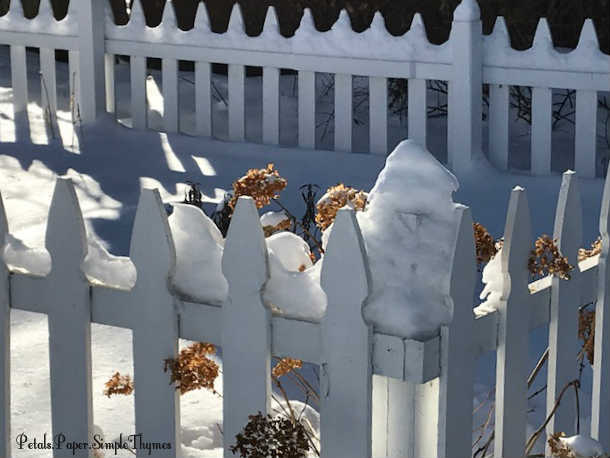 Stay warm and safe – it’s still winter out there. What a perfect description of ‘intentional,’ Penny! I hope it will guide me well as I make choices in the coming years. Purposeful is another very thoughtful, encouraging word. Isn’t it wonderful that certain words seem to speak to our hearts ~ if we take the time to listen? I will look forward to your post (and hot tea)! This morning, I bundled up for Round One of shoveling. The new fallen snow was so sparkly, it felt like I was shoveling glitter!😊 After a warming break, I’m ready to head back out for Round Two now. I’m thinking that it would be so pretty to take my parents for a Winter drive through the Arboretum. It would be fun to see the Trolls in the snow! We have been trying soooooo hard to keep my parents (and our water pipes) from freezing! They are being brave about this Winter weather, but really miss being outside. We will plan some nice outings as soon as the weather warms up! The blanket, the tea . . . your home looks so cozy during these cold winter days. Warmest Welcome, Sheryl! We are trying our very best to stay cozy! A few days have passed and the snow has begun to melt now. We have lots of memories of sweet family times to keep our hearts warm in the coming weeks. 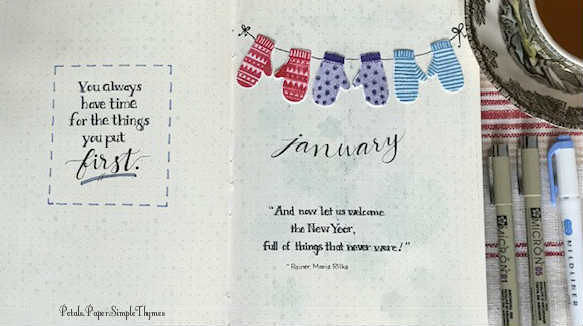 There is a stitched quote hanging on our wall that reminds us, “If winter comes, can spring be far behind?” So true! Thank you so much for visiting today and for your very kind words, Sheryl. You’ve been on my mind over the last few months. What an adventure you’ve had with your parents. I love that you’ve taken lots of photos to create memory books for them. Photos are so powerful. I hope they’re adjusting to your winter weather up north – I know how warm Phoenix can be. I’m wishing them a happy and easy transition to their new home – perhaps you’re out of your Arctic type weather now, perhaps things are moving along with their actual move into their new home . It takes time to make that adjustment for sure, and having some of their meaningful memories and precious items around them will certainly help. In Aotearoa NZ we’ve been sweltering in unseasonably hot weather this summer, and big forest fires in the last few weeks too. Definitely need to be planning our gardens to fireproof our homes as time goes by. Meanwhile I’m in my bus on my land and discovering a love of gardening – especially vegetable gardening. I seem to have an excess of everything and a fig tree I planted about 18 months ago when it was about a foot high, is now over 9 foot with lots of figs on it. Figs, passionfruit, many cucumbers, lemons, feijoas, and all the greens – so much coming on where there was nothing on this land less than 2 years ago. Certainly blessed with a wonderful growing climate. I’m using you and your gardening as an inspiration, and also a friend in London who has over the last 20 years grown an urban food forest in his back yard. My dream is to plant veggies rather than having grass that needs mowing. I look at how this land has changed in less than 2 years and I’m heartened. Especially as I know very little about veggie growing. And being a vegetarian I’m also in awe of how I can eat from my garden, buy very little food, and have enough to share around my neighbours. I too create a bullet journal each year, and using the same Rhodia notebook you use. I love it. I create a calendar for each month and then for each week for my to-dos. The calendar keeps track of where I am each day as I tend to move about a bit in my bus, and other things I want to keep track of. I love it and love having a way of keeping track of books I want to read, my master shopping list, money and more. It so well suits my love of order! Still working on starting a blog – need to come up with a new name as the name I chose turns out to be a little non-pc. Perhaps that’s why it hasn’t come to anything yet. But I have joined a wee writing group in my community for when I’m in town and lots of good is coming from that. Sending you lots of peace and energy as you savour this time with your parents. It’s so precious. I was just in Wellington helping my Dad celebrate his 90th birthday. He chose to go out to an Italian restaurant for lunch. His 94 year old brother came too, and my brother. It was lovely and he was very happy – having that to look forward to for a few months, the actual day, and now looking back on it. I managed to get a lovely photo of him too – don’t have that many recent ones. Love to you, and I hope it’s warming up a lot! Summer in New Zealand has been very challenging this year, too. So glad to know that you are Home Sweet Home and enjoying time in your garden. “Home is Where You Park It”… and it sounds like you are busy creating a lovely bit of paradise, Vicky! 🙂 I love that you are growing figs. We buy our figs from Greece, as the growing season is too short here. Growing fruits and veggies is a labor of love and good health! You should feel so proud of all of the ways that YOU have grown, too!! It warms my heart to know that we are both using Rhodia journals! Kindred spirits! 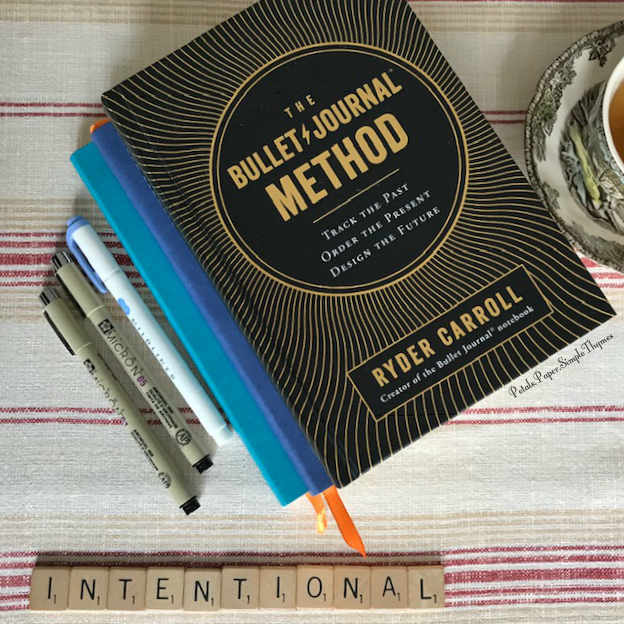 Have you read The Bullet Journal Method by Ryder Carroll yet? It’s a wealth of information and inspiration. I can only imagine what valuable tools your journals must be, Vicky. What fun it will be to look back and remember all of your experiences! They become a part of your memoir as you document your life this way. Will you have a separate Garden Journal? Or are you documenting everything in one bullet journal? I’m really looking forward to the debut of your blog, Vicky! 🙂 I would love to be your first follower. 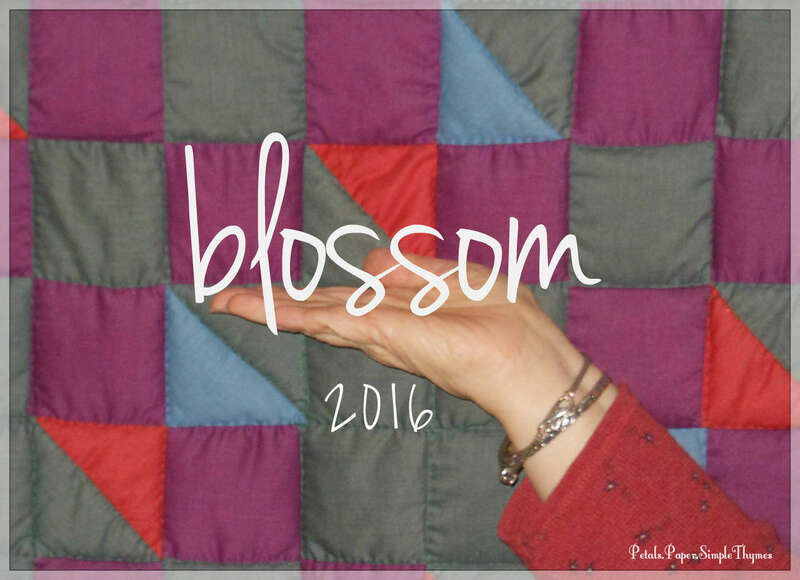 Your stories and photographs will be a truly lovely addition to the blogging world. We can chat about your ideas any time, if you like. So grateful for your gifts of peace and energy! It is a very precious time for our family. Many blessings to your dad! What special memories you all made at his birthday celebration. Your photo will be a treasure always! Lovely to hear from you Dawn. I love the connection we have across the miles. You WILL be my first subscriber for sure – I’ll keep you posted. I’d love to chat – have some ideas now for my blog – I was waiting for a focus! I haven’t read Ryder Carroll’s book yet – and haven’t quite figured out a way to record my gardening progress – perhaps need to make space in my existing bullet journal – seems too much to have another notebook. Let’s definitely chat, Vicky! Having a focus and a purpose makes blogging a joy. The people you connect with through your blog will become added blessings in your life. I know that you will find the perfect way to document your garden and all that it teaches you! An easy way is to take weekly photos throughout the growing season. 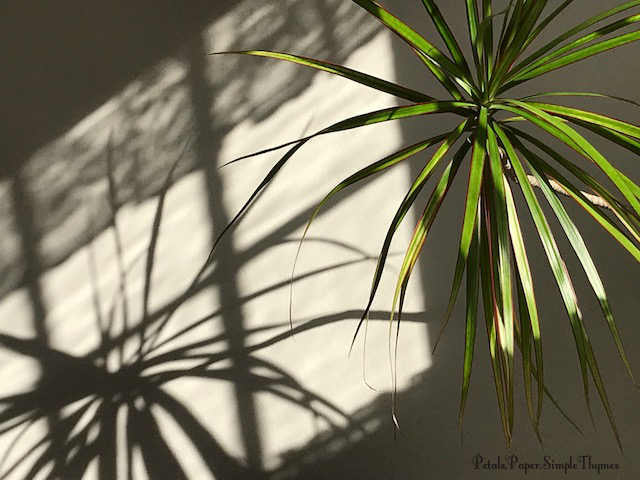 You can study your photos later on when you are not busy in the garden… as you plan for the next growing season. How long does your growing season last, Vicky? Good idea about the photos – I tend to forget that in the midst of everything. Your garden sounds just wonderful, Vicky! 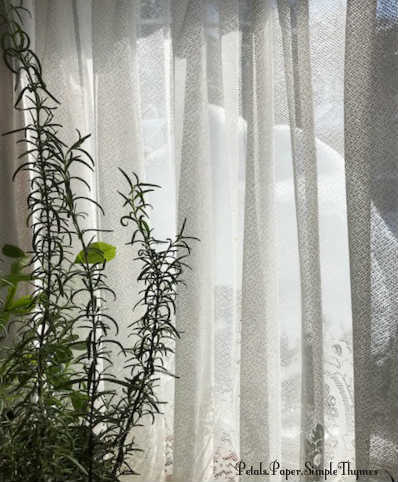 Will you plant herbs as companions for your veggies? Just the thought of gardening excites me! 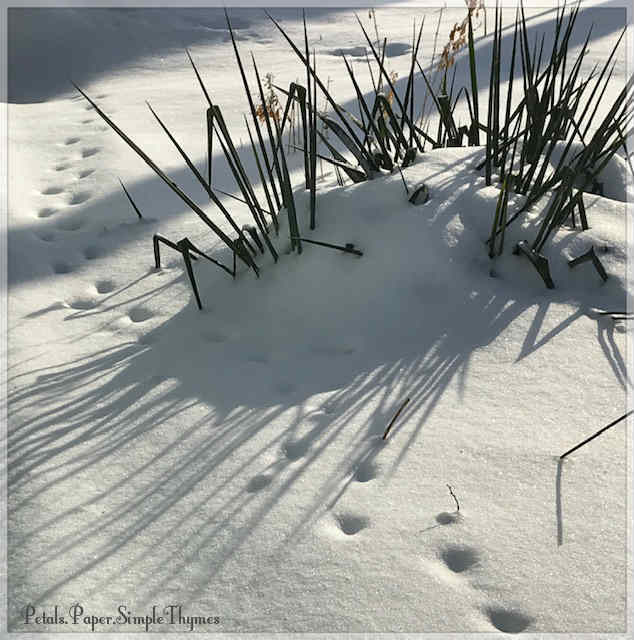 This week I will begin daily walks through my garden looking for the tiniest signs of Spring! It’s still much too early to do anything in our gardens here. Our safe planting day is May 15th. Until then, we can definitely dream our garden dreams!! It will be such fun to hear your voice (and all of your exciting plans) this week, my friend!